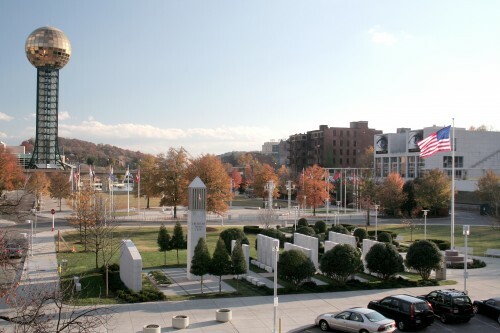 The East Tennessee Veterans Memorial in Knoxville’s World’s Fair Park bears the names of more than 6200 veterans from 35 East Tennessee counties who have died in military service since the beginning of World War I. Those counties are those that comprise the eastern grand division of the state plus Fentress and Sequatchie counties on the Cumberland Plateau. The Memorial has 32 granite pylons, each of them nine feet high, three feet wide and one foot deep. Names of the fallen are inscribed on the pylons up to a height of 54 inches from the ground, making the names accessible for touching by all visitors including those in wheel chairs. Each pylon contains roughly 220 names. Letters are approximately one half inch high. Names are sorted by conflict and further sorted by county within each conflict. Names are randomly listed (non-alphabetical, non-chronological) within each county. Blank space is provided for future names. Names of each of the 14 Medal of Honor recipients from these counties are inscribed on the opposite side of one of the pylons. A three-foot long granite bench is placed opposite each pylon for seated observation and contemplation. Walkways within the Memorial are also in granite. A circular plaza that forms the entrance features an American flag on a 50-foot pole. Information plaques at the base explain the history of the Memorial. Since the Memorial is lighted at night, the flag flies 24 hours a day. Another feature is a 27-foot high bell tower. On each of the four sides of the tower is inscribed one of the Four Essential Freedoms as enunciated by President Franklin D. Roosevelt in a speech to Congress on January 6, 1941 – freedom of speech and expression, freedom to worship, freedom from want, and freedom from fear. Names inscribed on the Memorial were collected and meticulously researched for accuracy and completion by the University of Tennessee Center for the Study of War and Society, for the East Tennessee Veterans Memorial Association. Names continue to be added annually after a careful process of consideration. The Memorial itself was designed by architect Lee Ingram of the Knoxville firm Brewer Ingram Fuller, who continues to be involved with the project. There are roughly 138 tons of granite in the Memorial – over a quarter of a million pounds. Most of the granite – all the white stone in the monuments and all the gray paving – comes from about 40 miles west of Yosemite National Park in California. The red granite paving comes from about 75 miles north of San Antonio, Texas. The black granite border is from a Quebec quarry about 125 miles north of Quebec City and about 135 miles from Maine. The initial list of names for the Memorial was compiled and researched by Cynthia Tinker of the University of Tennessee’s Center for the Study of War and Society. At the outset, the list totaled less than 5000 names. On completion of this meticulous process to check for completion and accuracy, the total is now over 6200. In addition to adding names from current conflicts, with continuing research and family contributions, more than 100 new names from past conflicts have been identified and engraved on the Memorial. The names represent a 35-county, regional East Tennessee area. The counties are those of the eastern grand division of the state plus Fentress and Sequatchie counties, from the Virginia border to the north to the Georgia border in the south, and from the North Carolina line on the east to the Cumberland Plateau to the west. Counties represented include Anderson, Bledsoe, Blount, Bradley, Campbell, Claiborne, Carter, Cocke, Cumberland, Fentress, Grainger, Greene, Hancock, Hamilton, Hamblen, Hawkins, Jefferson, Johnson, Knox, Loudon, Marion, McMinn, Meigs, Monroe, Morgan, Polk, Rhea, Roane, Scott, Sequatchie, Sevier, Sullivan , Unicoi, Union and Washington. In 1990, while visiting the Normandy beaches with his wife, Betty Felton, Knoxville businessman J. William “Bill” Felton III, was deeply moved by the thousands of white crosses in the American Military cemeteries marking the graves of those young men and women who never got a chance to return home and further their education, pursue careers, and raise a family. Felton, who had retired from the Army Reserves, returned to Knoxville and vowed to find a suitable way to honor and remember those from East Tennessee who made the ultimate sacrifice. During the ensuing months and years he doggedly pursued his dream, and the scope of the project was expanded to include all names on the physical Memorial of those who died in military service from the beginning of World War I.
Felton worked closely with local leaders to secure funding and a suitable site and the East Tennessee Veterans Memorial was dedicated November 15, 2008. Sadly, Felton passed away in June 2011, but the Memorial will stand as his enduring legacy and as a tribute to the brave men and women of East Tennessee. Early supporters of the East Tennessee Veterans Memorial were Knox County Mayor Mike Ragsdale and U. S. Rep. Jimmy Duncan. At Mayor Ragsdale’s request, Knox County Commission approved $1.25 million for the project. Rep. Duncan was instrumental in gaining approval by Congress of a $475,000 HUD grant. The State of Tennessee provided an additional $500,000 with the remainder provided by generous individuals, community groups and grants from private organizations. Kimberly Lauth served as the Operations Consultant through the dedication of the Memorial and provided the majority of the legwork in grant writing and general fundraising and still serves as a board member emeritus. Knoxville Mayor Bill Haslam worked to find a site for the Memorial, and in early 2006, Haslam, a 8000 square-foot plot at the northern edge of Knoxville’s World’s Fair Park was recommended to the City Council and a 100-year lease (at $1 per year) was signed. It was agreed that this site was especially appropriate, as it sat adjacent to the historic L & N Railroad Station where hundreds of trains left Knoxville carrying thousands of young men and women to war. Many of them did not return, and their names are inscribed on the Memorial.